Starting from humble origins in 2001, in a borrowed office with used furniture in Norway, Meltwater has since expanded to 57 offices worldwide with headquarters in San Francisco. 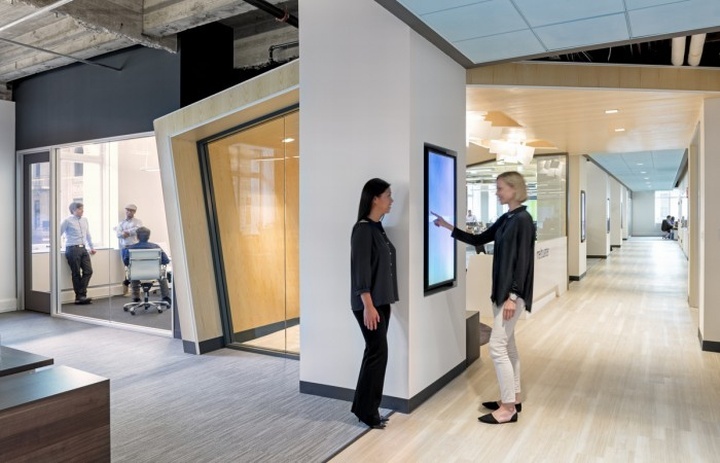 The company recently moved its headquarters to the historic Standard Oil building on Bush Street to accommodate its growing staff. 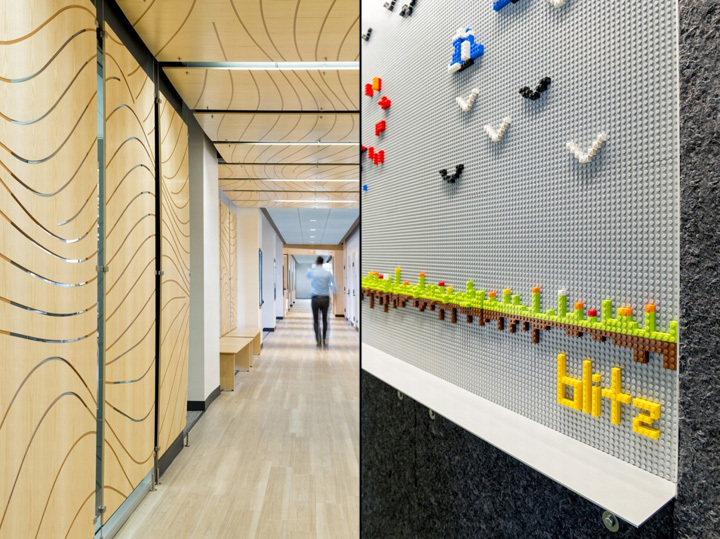 Desiring a space that would celebrate the company’s Norwegian heritage, Meltwater sought Blitz’s services for the interior design of the new office. 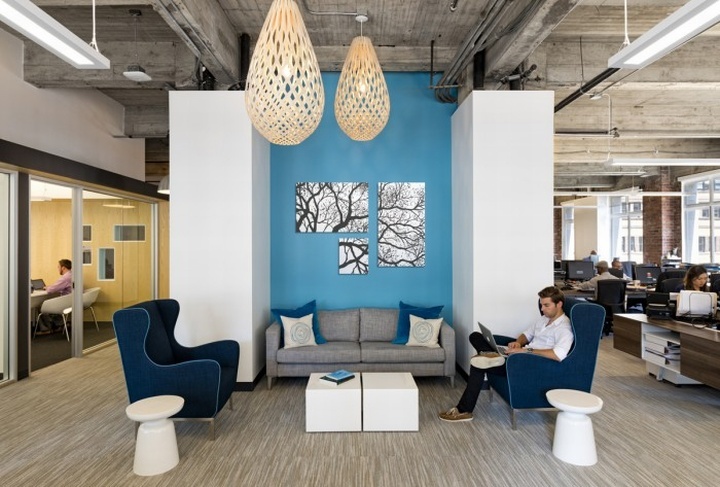 Blitz worked with Meltwater to create a sleek, contemporary office that combines Scandinavian modern design with cutting-edge, San Francisco tech industry style. Blitz looked to the Meltwater’s brand identity and core values for design direction, starting with the description of the company name as “the transformation of ice and snow to crystal clear, flowing water … a symbol of renewal and change.” Using the idea of water as both a circulatory and transformative element, Blitz designed the space with Norway’s largest river, the Glåma River, as a reference. The Glåma River runs from icy mountains in the north through farmland and into a small urban center in the south, past many different topographies and ecospheres in Norway. Similarly, the Meltwater office has a main circulation path that runs through the office and all of the departmental zones. Blitz selected four ecospheres found along the Glåma River – ice caps, waterfalls, green valleys, and ponds – to inform the design of the distinct zones in the Meltwater office. Each zone in the office reflects its respective Norwegian environment through colors, forms, and materiality. The reception features an articulated enclosure that is inspired by ice caps, with geometric hanging light fixtures evocative of ice crystals and a custom, angular desk that references layered, sheathed ice. 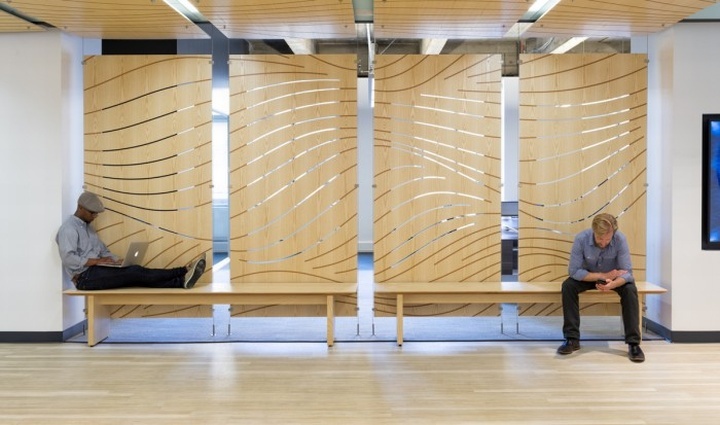 For the area around the work cafe, Blitz placed decorative, custom-patterned screens representing the flowing water of a waterfall to create a vibrant backdrop for social activities. 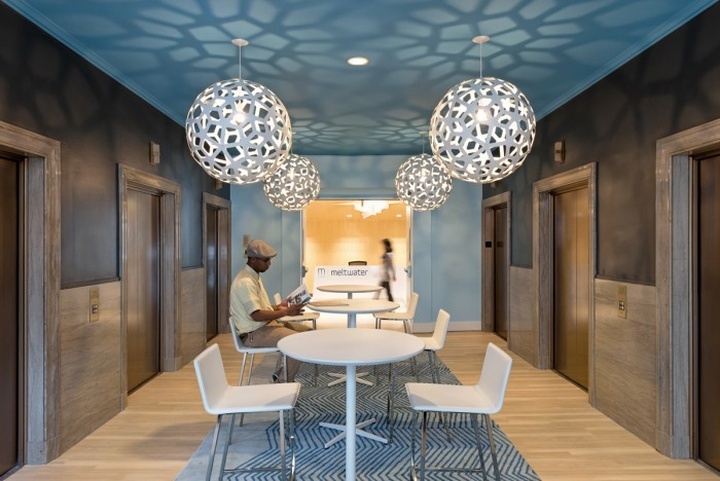 The Central Operations zone (pictured above) incorporates cool blues and a custom lighting element symbolizing water droplets to achieve the serenity of a calm pond. 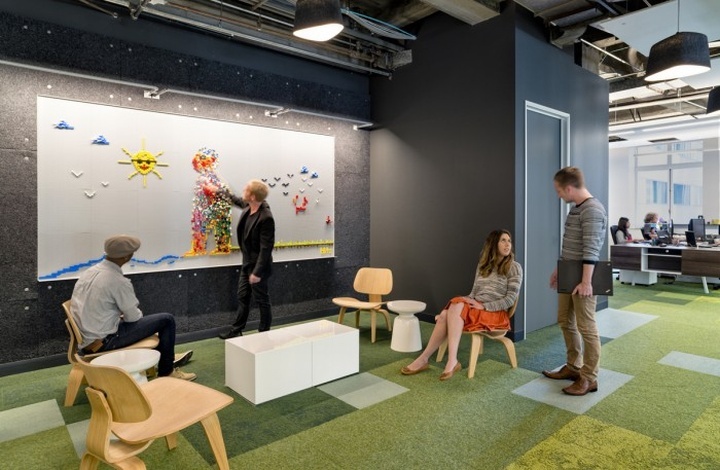 Lastly, the Engineering zone (pictured below) uses a pixelated, bold green carpet pattern and multilevel ceiling panels to depict the green tiles of farmland in Norway while brightening up a previously light-deprived space. 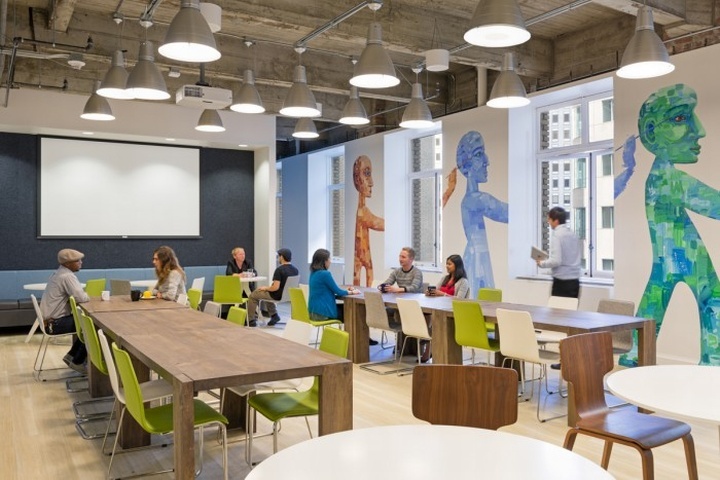 Blitz called upon the heritage of Scandinavian architecture to produce an overall design that would unify the space and evoke the company’s history, while keeping things true to the technologically advanced setting of San Francisco. 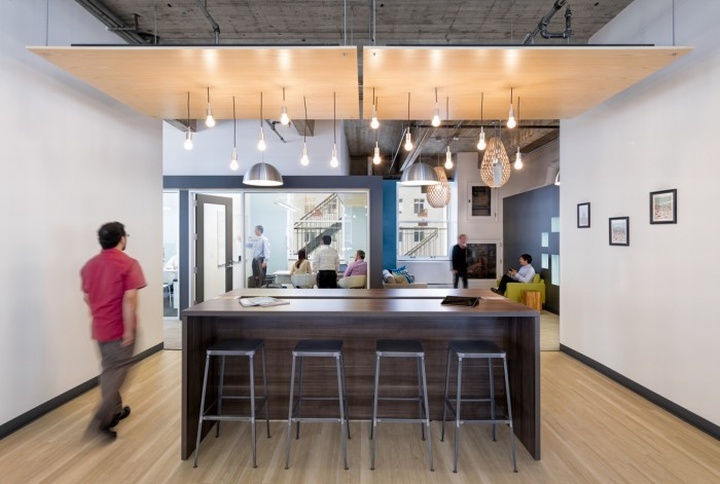 Within the distinct design schemes and throughout the office, a unified palette of materials consisting of warm woods and vibrant, crisp colors was specified not only to accentuate Meltwater’s heritage, but also to update it with a current San Francisco style.